Epidemiology. 2015 Nov;26(6):853-61. doi: 10.1097/EDE.0000000000000372. Luteijn JM1, Addor MC, Arriola L, Bianchi F, Garne E, Khoshnood B, Nelen V, Neville A, Queisser-Luft A, Rankin J, Rounding C, Verellen-Dumoulin C, de Walle H, Wellesley D, Wreyford B, Yevtushok L, de Jong-van den Berg L, Morris J, Dolk H.
BACKGROUND: In the context of the European Surveillance of Congenital Anomalies (EUROCAT) surveillance response to the 2009 influenza pandemic, we sought to establish whether there was a detectable increase of congenital anomaly prevalence among pregnancies exposed to influenza seasons in general, and whether any increase was greater during the 2009 pandemic than during other seasons. METHODS: We performed an ecologic time series analysis based on 26,967 pregnancies with nonchromosomal congenital anomaly conceived from January 2007 to March 2011, reported by 15 EUROCAT registries. Analysis was performed for EUROCAT-defined anomaly subgroups, divided by whether there was a prior hypothesis of association with influenza. Influenza season exposure was based on World Health Organization data. Prevalence rate ratios were calculated comparing pregnancies exposed to influenza season during the congenital anomaly-specific critical period for embryo-fetal development to nonexposed pregnancies. RESULTS: There was no evidence for an increased overall prevalence of congenital anomalies among pregnancies exposed to influenza season. We detected an increased prevalence of ventricular septal defect and tricuspid atresia and stenosis during pandemic influenza season 2009, but not during 2007-2011 influenza seasons. For congenital anomalies, where there was no prior hypothesis, the prevalence of tetralogy of Fallot was strongly reduced during influenza seasons. CONCLUSIONS: Our data do not suggest an overall association of pandemic or seasonal influenza with congenital anomaly prevalence. One interpretation is that apparent influenza effects found in previous individual-based studies were confounded by or interacting with other risk factors. The associations of heart anomalies with pandemic influenza could be strain specific. PLoS One. 2013 Apr 18;8(4):e61309. doi: 10.1371/journal.pone.0061309. Print 2013. Abstract BACKGROUND: Environmental exposure to respiratory syncytial virus (RSV) is a leading cause of respiratory infections in infants, but it remains unknown whether this infection is transmitted transplacentally from the lungs of infected mothers to the offspring. We sought to test the hypothesis that RSV travels from the respiratory tract during pregnancy, crosses the placenta to the fetus, persists in the lung tissues of the offspring, and modulates pre- and postnatal expression of growth factors, thereby predisposing to airway hyperreactivity. METHODOLOGY: Pregnant rats were inoculated intratracheally at midterm using recombinant RSV expressing red fluorescent protein (RFP). Viral RNA was amplified by RT-PCR and confirmed by sequencing. RFP expression was analyzed by flow cytometry and viral culture. Developmental and pathophysiologic implications of prenatal infection were determined by analyzing the expression of genes encoding critical growth factors, particularly neurotrophic factors and receptors. We also measured the expression of key neurotransmitters and postnatal bronchial reactivity in vertically infected lungs, and assessed their dependence on neurotrophic signaling using selective biological or chemical inhibition. PRINCIPAL FINDINGS: RSV genome was found in 30% of fetuses, as well as in the lungs of 40% of newborns and 25% of adults. RFP expression was also shown by flow cytometry and replicating virus was cultured from exposed fetuses. Nerve growth factor and its TrkA receptor were upregulated in RSV- infected fetal lungs and co-localized with increased cholinergic innervation. Acetylcholine expression and smooth muscle response to cholinergic stimulation increased in lungs exposed to RSV in utero and reinfected after birth, and blocking TrkA signaling inhibited both effects. CONCLUSIONS/SIGNIFICANCE: Our data show transplacental transmission of RSV from mother to offspring and persistence of vertically transmitted virus in lungs after birth. Exposure to RSV in utero is followed by dysregulation of neurotrophic pathways predisposing to postnatal airway hyperreactivity upon reinfection with the virus. Rubinstein F, Micone P, Bonotti A, Wainer V, Schwarcz A, Augustovski F, Pichon Riviere A, Karolinski A; on behalf of "EVA" Study Research Group (Estudio "Embarazo y Vacuna Antigripal"). BMJ. 2013 Feb 4;346:f393. doi: 10.1136/bmj.f393. This large study using primary data collection found that MF59 adjuvanted A/H1N1 influenza vaccine did not result in an increased risk of adverse perinatal events and suggested a lower risk among vaccinated women. These findings should contribute to inform stakeholders and decision makers on the prescription of vaccination against influenza A/H1N1 in pregnant women. Viruses. 2012 Oct 9;4(10):2031-48. doi: 10.3390/v4102031. Yun NE, Walker DH. Source Department of Pathology, University of Texas Medical Branch, Galveston, Texas, USA. dwalker@utmb.edu. Lassa virus, an Old World arenavirus (family Arenaviridae), is the etiological agent of Lassa fever, a severe human disease that is reported in more than 100,000 patients annually in the endemic regions of West Africa with mortality rates for hospitalized patients varying between 5-10%. Currently, there are no approved vaccines against Lassa fever for use in humans. Here, we review the published literature on the life cycle of Lassa virus with the specific focus put on Lassa fever pathogenesis in humans and relevant animal models. Advancing knowledge significantly improves our understanding of Lassa virus biology, as well as of the mechanisms that allow the virus to evade the host's immune system. However, further investigations are required in order to design improved diagnostic tools, an effective vaccine, and therapeutic agents. Lancet Infect Dis. 2012 Apr;12(4):330-40. doi: 10.1016/S1473-3099(11)70341-3. Epub 2012 Feb 24. Dauby N, Goetghebuer T, Kollmann TR, Levy J, Marchant A. Source Institute for Medical Immunology, Université Libre de Bruxelles, Charleroi, Belgium. Abstract Chronic infections during pregnancy are highly prevalent in some parts of the world. Infections with helminths, Trypanosoma cruzi, Plasmodium spp, and HIV might affect the development of fetal immunity and susceptibility to postnatal infections independently of in-utero transmission of the pathogens. Fetal adaptive immune responses are common in neonates who have been exposed to maternal infection during pregnancy but not infected themselves. Such responses could affect the development of immunity to the homologous pathogens and their control during the first few years of life. Fetal innate and regulatory responses might also affect immunity to unrelated pathogens and responses to vaccines. Strategies to improve child health should integrate the possible clinical implications of in-utero exposure to chronic maternal infections. Copyright © 2012 Elsevier Ltd. All rights reserved. Reprod Health. 2011 Nov 30;8:35. doi: 10.1186/1742-4755-8-35. OBJECTIVES: to evaluate mother-to-child transmission (MTCT) rates and related factors in HIV-infected pregnant women from a tertiary hospital between 2000 and 2009. SUBJECTS AND METHOD: cohort of 452 HIV-infected pregnant women and their newborns. Data was collected from recorded files and undiagnosed children were enrolled for investigation. Statistical analysis: qui-square test, Fisher exact test, Student t test, Mann-Whitney test, ANOVA, risk ratio and confidence intervals. RESULTS: MTCT occurred in 3.74%. The study population displayed a mean age of 27 years; 86.5% were found to have acquired HIV through sexual contact; 55% were aware of the diagnosis prior to the pregnancy; 62% were not using HAART. Mean CD4 cell-count was 474 cells/ml and 70.3% had undetectable viral loads in the third trimester. HAART included nevirapine in 35% of cases and protease inhibitors in 55%; Zidovudine monotherapy was used in 7.3%. Mean gestational age at delivery was 37.2 weeks and in 92% by caesarian section; 97.2% received intravenous zidovudine. Use of AZT to newborn occurred in 100% of them. Factors identified as associated to MTCT were: low CD4 cell counts, elevated viral loads, maternal AIDS, shorter periods receiving HAART, other conditions (anemia, IUGR (intra uterine growth restriction), oligohydramnium), coinfecctions (CMV and toxoplasmosis) and the occurrence of labor. Use of HAART for longer periods, caesarian and oral zidovudine for the newborns were associated with a decreased risk. Poor adhesion to treatment was present in 13 of the 15 cases of transmission; in 7, coinfecctions were diagnosed (CMV and toxoplasmosis). CONCLUSION: Use of HAART and caesarian delivery are protective factors for mother-to-child transmission of HIV. Maternal coinfecctions and other conditions were risk factors for MTCT. Infect Dis Obstet Gynecol. 2012;2012:385697. Epub 2012 Apr 11. Infection with herpes simplex is one of the most common sexually transmitted infections. Because the infection is common in women of reproductive age it can be contracted and transmitted to the fetus during pregnancy and the newborn. Herpes simplex virus is an important cause of neonatal infection, which can lead to death or long-term disabilities. Rarely in the uterus, it occurs frequently during the transmission delivery. The greatest risk of transmission to the fetus and the newborn occurs in case of an initial maternal infection contracted in the second half of pregnancy. The risk of transmission of maternal-fetal-neonatal herpes simplex can be decreased by performing a treatment with antiviral drugs or resorting to a caesarean section in some specific cases. The purpose of this paper is to provide recommendations on management of herpes simplex infections in pregnancy and strategies to prevent transmission from mother to fetus. Proc Natl Acad Sci U S A. 2012 Sep 11;109(37):14989-94. Epub 2012 Aug 7. Lin WH, Kouyos RD, Adams RJ, Grenfell BT, Griffin DE. Source W. Harry Feinstone Department of Molecular Microbiology and Immunology, Johns Hopkins Bloomberg School of Public Health, Johns Hopkins University, Baltimore, MD 21205. Measles virus (MeV) is the poster child for acute infection followed by lifelong immunity. However, recent work shows the presence of MeV RNA in multiple sites for up to 3 mo after infection in a proportion of infected children. Here, we use experimental infection of rhesus macaques to show that prolonged RNA presence is characteristic of primary infection. We found that viral RNA persisted in the blood, respiratory tract, or lymph nodes four to five times longer than the infectious virus and that the clearance of MeV RNA from blood happened in three phases: rapid decline coincident with clearance of infectious virus, a rebound phase with increases up to 10-fold, and a phase of slow decrease to undetectable levels. To examine the effect of individual host immune factors on MeV load dynamics further, we developed a mathematical model that expressed viral replication and elimination in terms of the strength of MeV-specific T-cell responses, antibody responses, target cell limitations, and immunosuppressive activity of regulatory T cells. Based on the model, we demonstrate that viral dynamics, although initially regulated by T cells, require antibody to eliminate viral RNA. These results have profound consequences for our view of acute viral infections, the development of prolonged immunity, and, potentially, viral evolution. Mandelbrot L. Source Hopital Louis Mourier, Service de Gynécologie-Obstétrique, Hôpitaux Universitaires Paris Nord Val de Seine, Assistance Publique-Hôpitaux de Paris, Université Paris-Diderot, 178 rue des Renouillers, 92701, Colombes cedex, France. laurent.mandelbrot@lmr.aphp.fr. Fetal varicella syndrome (FVS) is due to transplacental infection by the Varicella zoster virus following maternal infection. The risks for the fetus and neonate depend on the timing. When varicella occurs around delivery, it often leads to disseminated neonatal varicella. When varicella occurs during pregnancy, transmission can occur, but is usually asymptomatic; some infants develop zoster postnatally and a few have FVS. Before 20 weeks' gestation, FVS can occur, with an incidence of about 1%. The lesions can affect the skin, limbs, central and autonomous nervous systems, eyes, cause calcifications, and growth retardation; mortality is high. Lesions typically follow one or several nerve territories, suggesting that damage results from in utero zoster following primary fetal infection. There has been little study of prenatal diagnosis of FVS. Serial ultrasound examination can detect various anomalies, magnetic resonance imaging can be of use to investigate for microphthamia and cerebral lesions, and amniocentesis can diagnose viral transmission. Prevention strategies include vaccination and post-exposure prophylaxis with immune globulin and/or antivirals. Perspectives for treating infected fetuses in utero require further research. © 2012 John Wiley & Sons, Ltd. © 2012 John Wiley & Sons, Ltd.
PLoS Negl Trop Dis. 2012 Mar;6(3):e1575. Epub 2012 Mar 20. Qiu X, Fernando L, Melito PL, Audet J, Feldmann H, Kobinger G, Alimonti JB, Jones SM. Source Special Pathogens Program, National Microbiology Laboratory, Public Health Agency of Canada, Winnipeg, Manitoba, Canada. Curr Pharm Biotechnol. 2011 May;12(5):789-96. Fox KA, Theiler R. Source Department of Obstetrics and Gynecology, University of Texas Medical Branch at Galveston, Galveston, TX 77550, USA. The recent H1N1 influenza pandemic has highlighted the potential for viral infections to cause severe disease in mothers disproportionate to the general population and have deleterious effects on the fetus. Vaccines have been used in pregnant women for over 200 years. Current guidelines recommend vaccination with only inactivated virus due to potential risk to mother and fetus with live vaccine. The exception is during times of pandemic or biological weapons attack, when the risk of life-threatening disease outweighs the risk of vaccination. A paucity of data is available regarding actual risk and mechanisms of live viral vaccine transfer from mother to fetus. Pregnancy-induced changes to the maternal immune system, effects of maternal infection on neonatal immunity, and the role of the placenta in transmission of infection and passive immunity to the fetus are incompletely understood. The aim of this paper is to review available data pertaining to newer vaccines such as the pandemic H1N1 and HPV vaccines in pregnancy, the role of Fc receptors in active transport of immunoglobulin across the placenta, and cytokine activity during maternal infection and after vaccination. We will also discuss potential areas for future research. BMJ. 2011 Jun 14;342:d3214. doi: 10.1136/bmj.d3214. Pierce M, Kurinczuk JJ, Spark P, Brocklehurst P, Knight M; UKOSS. Source National Perinatal Epidemiology Unit, University of Oxford, Oxford OX3 7LF, UK. Abstract OBJECTIVES: To follow up a UK national cohort of women admitted to hospital with confirmed 2009/H1N1 influenza in pregnancy in order to obtain a complete picture of pregnancy outcomes and estimate the risks of adverse fetal and infant outcomes. DESIGN: National cohort study. SETTING: 221 hospitals with obstetrician led maternity units in the UK. PARTICIPANTS: 256 women admitted to hospital with confirmed 2009/H1N1 in pregnancy during the second wave of pandemic infection between September 2009 and January 2010; 1220 pregnant women for comparison. MAIN OUTCOME MEASURES: Rates of stillbirth, perinatal mortality, and neonatal mortality; odds ratios for infected versus comparison women. RESULTS: Perinatal mortality was higher in infants born to infected women (10 deaths among 256 infants; rate 39 (95% confidence interval 19 to 71) per 1000 total births) than in infants of uninfected women (9 deaths among 1233 infants; rate 7 (3 to 13) per 1000 total births) (P < 0.001). This was principally explained by an increase in the rate of stillbirth (27 per 1000 total births v 6 per 1000 total births; P = 0.001). Infants of infected women were also more likely to be born prematurely than were infants of comparison women (adjusted odds ratio 4.0, 95% confidence interval 2.7 to 5.9). Infected women who delivered preterm were more likely to be infected in their third trimester (P = 0.046), to have been admitted to an intensive care unit (P < 0.001), and to have a secondary pneumonia (P = 0.001) than were those who delivered at term. CONCLUSIONS: This study suggests an increase in the risk of poor outcomes of pregnancy in women infected with 2009/H1N1, which reinforces the message from studies of maternal risk alone. The health of pregnant women is an important public health priority in future waves of this and other influenza pandemics. Comment in Evid Based Nurs. 2012 Jan;15(1):11-2. BMJ. 2011;342:d3237. Nucleic Acids Res. 2011 Jan;39(Database issue):D576-82. Epub 2010 Oct 14. Hulo C, de Castro E, Masson P, Bougueleret L, Bairoch A, Xenarios I, Le Mercier P.Source Swiss-Prot group, Swiss Institute of Bioinformatics, Centre Médical Universitaire, CH-1211 Geneva 4, Switzerland. The molecular diversity of viruses complicates the interpretation of viral genomic and proteomic data. To make sense of viral gene functions, investigators must be familiar with the virus host range, replication cycle and virion structure. Our aim is to provide a comprehensive resource bridging together textbook knowledge with genomic and proteomic sequences. ViralZone web resource (www.expasy.org/viralzone/) provides fact sheets on all known virus families/genera with easy access to sequence data. A selection of reference strains (RefStrain) provides annotated standards to circumvent the exponential increase of virus sequences. Moreover ViralZone offers a complete set of detailed and accurate virion pictures. vaccine Cervarix (GSK) and Gardasil (Merck) protect against HPV types 16 and 18, and, through cross-protection, partially also against HPV types 31 and 45. Di Stefano M, Calabrò ML, Di Gangi IM, Cantatore S, Barbierato M, Bergamo E, Kfutwah AJ, Neri M, Chieco-Bianchi L, Greco P, Gesualdo L, Ayouba A, Menu E, Fiore JR. Source Laboratory of Molecular Medicine, University of Foggia, Foggia, Italy. Abstract Herpesvirus infection of placenta may be harmful in pregnancy leading to disorders in fetal growth, premature delivery, miscarriage, or major congenital abnormalities. Although a correlation between human herpesvirus 8 (HHV-8) infection and abortion or low birth weight in children has been suggested, and rare cases of in utero or perinatal HHV-8 transmission have been documented, no direct evidence of HHV-8 infection of placenta has yet been reported. The aim of this study was to evaluate the in vitro and in vivo susceptibility of placental cells to HHV-8 infection. Short-term infection assays were performed on placental chorionic villi isolated from term placentae. Qualitative and quantitative HHV-8 detection were performed by PCR and real-time PCR, and HHV-8 proteins were analyzed by immunohistochemistry. Term placenta samples from HHV-8-seropositive women were analyzed for the presence of HHV-8 DNA and antigens. In vitro infected histocultures showed increasing amounts of HHV-8 DNA in tissues and supernatants; cyto- and syncitiotrophoblasts, as well as endothelial cells, expressed latent and lytic viral antigens. Increased apoptotic phenomena were visualized by the terminal deoxynucleotidyl transferase-mediated deoxyuridine nick end-labeling method in infected histocultures. Ex vivo, HHV-8 DNA and a latent viral antigen were detected in placenta samples from HHV-8-seropositive women. These findings demonstrate that HHV-8, like other human herpesviruses, may infect placental cells in vitro and in vivo, thus providing evidence that this phenomenon might influence vertical transmission and pregnancy outcome in HHV-8-infected women. Adenovirus - presence in the respiratory tract is often not accompanied by symptoms. The virus may be shed over long periods of time, so the association between isolation and clinical symptoms is not definitive. However it can cause severe respiratory illness, especially as local outbreaks. Coronavirus - Nasal discharge and malaise are typical, while a cough and sore throat are generally not prominent and there is no fever. The illness lasts about a week and is usually of no real consequence. 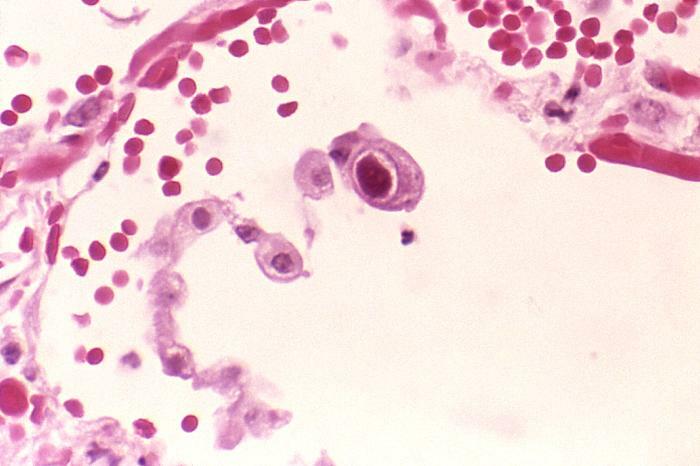 Coronaviruses are difficult to grow in cultured cells and are therefore rarely recovered from specimens. Influenza virus - cause highly contagious respiratory disease, which typically result in yearly winter epidemics. Types A and B cause the same spectrum of disease although type A infections result in hospitalisation more often than type B does. Parainfluenza viruses - there are four parainfluenza virus types, only types 1, 2 and 3 are readily detected. All three viruses have distinct seasonal epidemiological patterns. Generally types 1 and 2 have an autumn epidemic peak while type 3 is endemic occurring sporadically throughout the year. Parainfluenza viruses are the most common cause of viral croup. Respiratory Syncytial Virus (RSV) - infection is the principal cause of bronchiolitis and pneumonia in infants. In adults it usually causes "common cold" like symptoms and the elderly are prone to pneumonia. RSV epidemics occur in the winter months and sporadically at other times. Infection usually lasts between 7-14 days. Rhinovirus - responsible for one third to one half of the "common colds" people suffer every year. There are a large number of serotypes, so vaccines do not prevent against infection. Laboratory confirmation can be difficult, and is generally not feasible. Infection usually remains localised to the upper respiratory tract and symptom resolution generally occurs within a week. 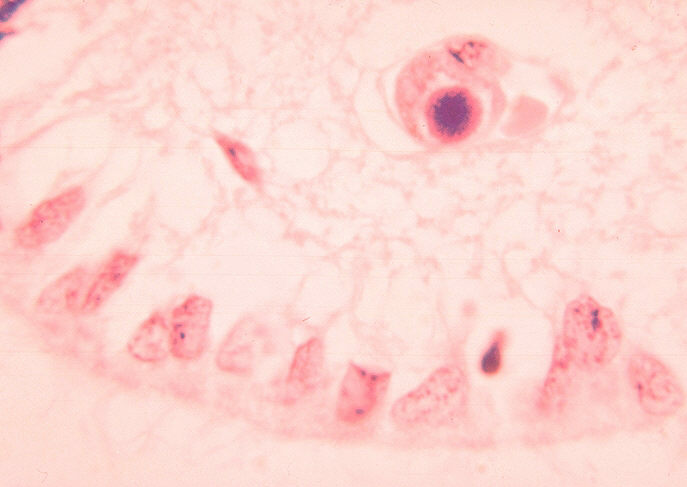 ID#:1160 Description: Histopathology of cytomegalovirus infection of brain. 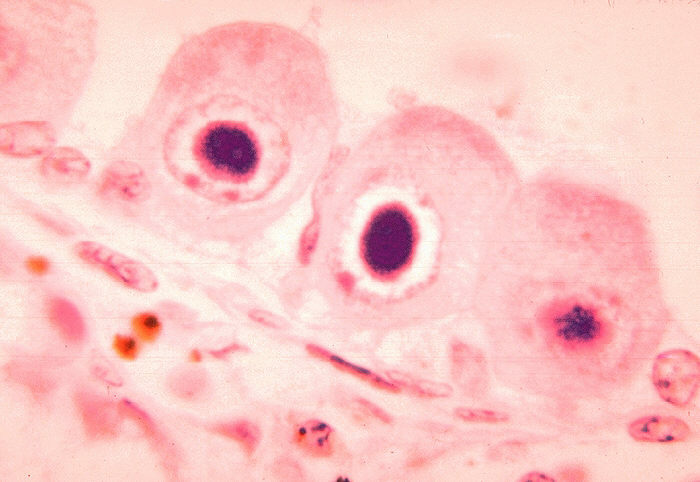 Histopathology of cytomegalovirus infection of brain capillary endothelial cell. Copyright Restrictions:None - This image is in the public domain and thus free of any copyright restrictions. As a matter of courtesy we request that the content provider be credited and notified in any public or private usage of this image. Description: Histopathology of cytomegalovirus infection of kidney. 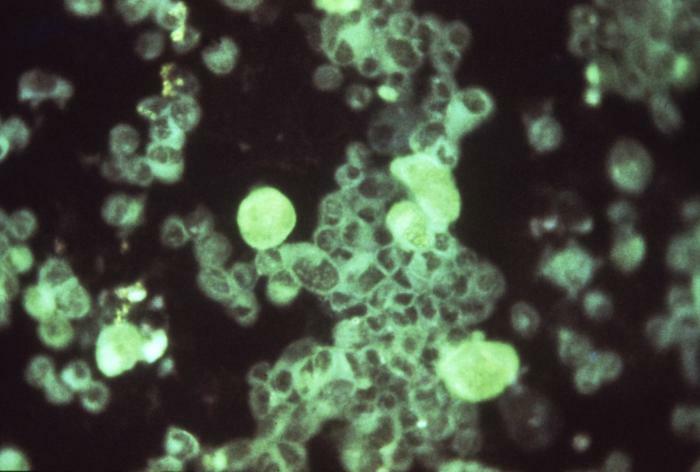 Description:Active cytomegalovirus infection of lung in AIDS. 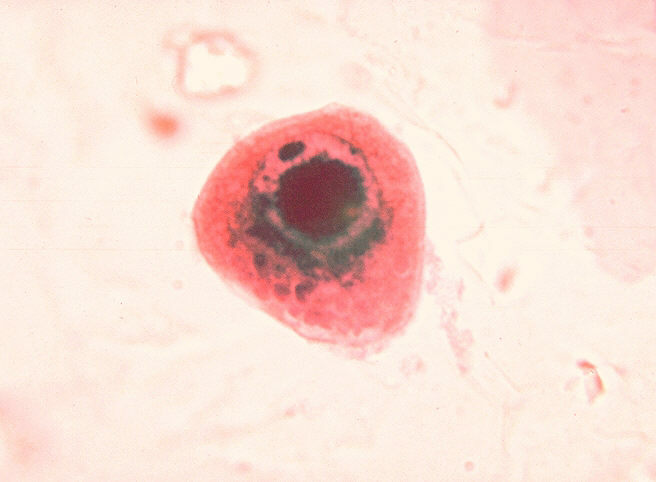 Histopathology of lung shows cytomegalic pneumocyte containing characteristic intranuclear inclusion. High Resolution:Right click here and select "Save Target As..." for hi-resolution image (6.52 MB)Content Providers(s):CDC/ Dr. Edwin P. Ewing, Jr.Creation Date:1982Copyright Restrictions:None - This image is in the public domain and thus free of any copyright restrictions. As a matter of courtesy we request that the content provider be credited and notified in any public or private usage of this image. get a blotchy red rash which comes and goes and usually disappears altogether after 2 days. sometimes suffer with a light cold prior to the rash appearing. dangerous for pregnant women who have no immunity to the virus. infection period is usually a week before the rash until a week after it has disappeared. a mild upper respitatory affect. get a rash of spots, very high temperature which can last up to 4 days, cough, severe conjunctivitis and possibly encephalitis. This page was last modified on 19 October 2015, at 06:13.